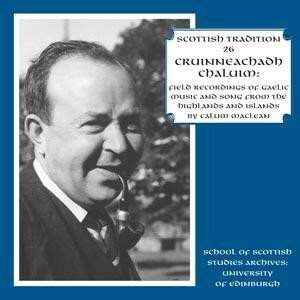 Scottish Tradition Volume 26: Cruinneachadh Chaluim - Field Recordings of Gaelic Music and Song, The Scottish Music Shop - The Best Selection of Scottish CDs and Scottish DVDs. A double CD set with one CD consisting of songs and the other featuring instrumental music. This is the 26th collection in the Scottish Tradition Series of recordings from The School of Scottish Studies Archives at the University of Edinburgh. The School and Greentrax are delighted to present this double CD collection, selected from the extensive collecting of Calum MacLean. We never tire of saying the series was described in the past as “The most important series of traditional recordings ever…” CD1 comprises a wide range of singers and songs from the Highlands and Islands of Scotland, while CD2 consists of instrumental music, equally diverse and also from the Highlands and Islands, all collected by Calum MacLean. This is a remarkable and unique Scottish Tradition Series collection, adding even more depth to the Series. The album was mastered by Peter Haigh of Pier House Studios and the design is by John Slavin of Designfolk.